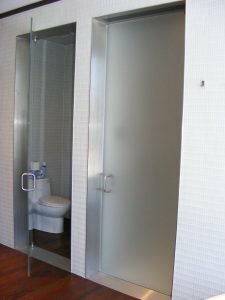 GlassWorks began offering Glass Toilet Enclosures to unify our client’s bathrooms where the shower and toilet doors were in close proximity. GlassWorks has innovated new designs that bring the elegance and sleekness of glass to new uses that simply were not thought of years ago. Let us show you how our thirty years of experience in the glass industry can help improve your bathroom layout. Our glass toilet enclosures provide you with the privacy you’ve always wanted in your bathroom.